Web 2.0 and Social Networks have gained perceptible mindshare during Q1 2009, and conversations with clients, fellow speakers at conferences and online conversation are clearly showing the reappearance of a familiar adoption curve. Here I will discuss the Adoption Curve for Web 2.0 and Social Networks and provide rough milestones, so you can use it to gauge your investments in Web 2.0. You can avoid some of the extremes that the majority of the market will experience. In addition, I will also show how Web 2.0 provides a rare opportunity to develop competitive advantage ahead of the market. Having been on the front lines of PricewaterhouseCoopers Consulting’s E-Business Strategy practice during Web 1.0 (the Internet bubble), I am not surprised to see the familiar bubble pattern developing, so this is a rare opportunity to recognize it and produce tremendous value by avoiding some of the mistakes most companies make when adopting disruptive technology. What I wish to draw your attention to is not the disruptive technology itself, but rather the market’s perception of the technology. The Web 1.0 bubble was caused by distorted perceptions of the technology, what it could do, and when it could produce value. Companies’ perceptions of the value it could deliver were unrealistic. However, the Internet has produced fantastic value; it just took longer than most people thought. Therefore, a rare opportunity presents itself: what if executives could understand the Web 2.0 Adoption Curve and make more realistic investments? Initial Discovery (2006-2007)—Skunk works approach by visionaries while most executives wrote off social networks as something for “kids.” Very few executives got past the “gee whiz” stage. There were very few skills within the organization to succeed with Web 2.0; most were sourced outside. Hype & Experimentation (2008-2009)—As the curve shows, the first half of this section builds slowly, but its slope increases markedly in the second half. In the U.S., Obama trounced Clinton (more here) because the campaign recognized the promise of Web 2.0 and made it the tip of the spear. It was a classic example of a challenger employing unproven technology to upset the dominant player. It was an exciting case study, and politicians and executives worldwide have taken note. During this stage, the market grasps some of the key concepts represented by Web 2.0, but it lacks the experience to apply them to business processes with consistent success. This phase will culminate this year in the apex of immature adoption (Gartner’s “Peak of Inflated Expectations”). Web 2.0 providers flood into the market, so this stage is also characterized by providers that barely know more than their clients leading initiatives that often fail. Failure & Disappointment (2010)—Most Web 2.0 initiatives will fall short of expectations, which always contain some kind of result tied to time. Because enthusiasts do not understand the application of the disruptive technology, they make false assumptions, and initiatives are not successful, so they are curtailed in a classic backlash. In consulting, a key value proposition is helping your client to set realistic expectations so they keep investing while others sit on the sidelines. Triumph of Determination (2011-2013)—While most enterprises will write off Web 2.0 as a failed curiosity, a determined few will continue investing, learn how to apply it and transform themselves, and they will produce case studies. This will take longer than expected. Pervasive Adoption (2014-2015)—Mass adoption will occur here as the technology and attendant work processes will be recognized and broadly practiced. The Internet has been at this stage for the past several years; the innovations and application to work processes have long been more incremental than during Web 1.0. Notice that the vertical axis is perceived value while the horizontal axis is Learning & Competence. 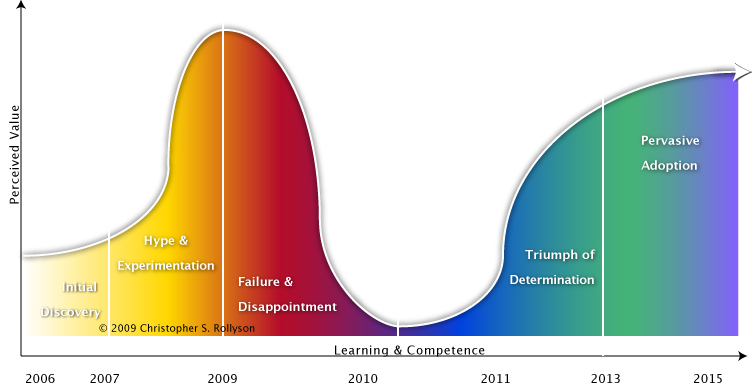 The curve shows that during 2009 perceived value is high, but competence is low, which leads to failures and rapidly falling perceived value in late 2009 and 2010. Significant learning and competence develop with little mass perceived value from 2010 to 2011, which leads to a more sustainable curve in 2013 and beyond. Disruptive technology always takes the market by surprise. It is by nature not initially perceived as a “serious” proposition by the majority of the market, so it does not enjoy the rigor with which organizations approach their mature processes. In addition, transformation faces extensive opposition within the corporate organism, as many executives do not believe that legacy processes need to be changed. There will be a prolonged period in which Web 2.0 will struggle to gain the mindshare of key executives and middle management and in which the enterprise develops the skills necessary to succeed. Social networks significantly reduce the cost of communication and relationship building. In How Social Networks Make Markets More Efficient for Buyers and Sellers, I showed how this affects profits. At this point, if you recognize social networks’ value proposition, you can approach initiatives with more purpose. Imagine if you had realized the Internet’s full potential in 1995, and you had invested with that purpose in mind. This is the opportunity that executives have today with Web 2.0. Employ healthy skepticism when you encounter technology-based propositions that do not explicitly address how they will change behavior. The market is accustomed to assuming that technology leads innovation. Web 2.0 largely employs software-as-a-service technology that imposes very little on users. To succeed, leaders must focus on behavior, not technology. Keep in mind that few people have extensive experience with Web 2.0 and social networks. “Failure & Disappointment” occurs because expectations (and investments) are too high compared to competence. Mitigate risk by chunking investments relatively small. Be wary of making large fixed cost investments (i.e. technology). Aggressively focus on developing your organization’s competence with social networks because Web 2.0 communications will be core to your success going forward. Web 2.0 is analogous to a “21st century telephone” that everyone will use to communicate differently than they do now. As the Internet came to touch virtually all areas of commerce, social networks will assume an increasingly dominant role in how all people communicate. This will bring with it a new culture of openness (transparency), cooperation, service, reputation, and lack of hierarchy. Networks are anti-hierarchy. These cultural shifts will prove to be the most challenging to large enterprises with large hierarchies. Try not to depend on vendors or consultants to do things for you; insist on learning. I think I’m going to call this the Dismal Theorem of Rollyson or why Web 2.0 is destined to fail – first time around. Based on my experience “in the trenches” I believe you are spot on. I am working with clients & prospects who have not truly aligned their business processes, strategies or policies with the practicalities of Web 2.0. Nor do they perceive that such is required. They view this as a technical implementation as in “we want a website with Web 2.0 capabilities.” Clearly they don’t understand that THEY are the capability and the technology is merely the enabler. They will fail, but they will return wiser.